In this age of digital content, data collections in normal households are growing rapidly. Whereas just a few years ago, hard drives with a couple hundred gigabytes were perfectly sufficient, today, multiple-terabyte disk storage capacity is commonly used. The Linux filesystems ext2, ext3, and ext4 don’t need that much attention, but over time, after innumerable writes and deletes, data becomes fragmented. This slows down not just the hard disk itself, but also the entire system – sometimes noticeably. Thus, power users, even on Linux, are advised to reorganize their data occasionally. Fragmentation is something that primarily affects larger files that will not fit completely into the free space on a hard drive because of a lack of sufficiently large, contiguous space; thus, a file will reside in different segments (see the “Theory” box). When such a file is read, the read heads move to a new position several times to gather the pieces. This movement takes time and continues to increase on heavily fragmented disks. User data isn’t the only contributor to fragmentation; the operating system itself encourages the big divide: Power users who like to experiment and often try out software also contribute to fragmentation by installing new programs and then deleting them. Partitions on which more than half of the capacity is used will fragment data more heavily as the system needs to spread larger files over an increasing number of areas because of the lack of free space. Ultimately, generally useful tools like BleachBit or Rpmorphan can aggravate the situation under certain circumstances by removing files that are no longer needed: Deletions between allocated segments generate non-contiguous free blocks. To minimize file defragmentation, common filesystems like ext2 and its successors ext3 and ext4 include some mechanisms to counteract the effect. For example, to attempt to copy data completely to contiguous free space on the hard disk, filesystems keep data to be written in RAM for a period of time until the final size is determined. Moreover, filesystems reserve free block groups on the hard disk to store growing files completely. Even such forward-looking mechanisms cannot deal fully with the problem. As for many problems, Linux includes on-board solutions for which other operating systems require additional, and often expensive, software. Fragmentation is no exception, with Linux offering a number of ways to resolve the issue. Before you start what could be a quite lengthy defragmentation run – depending on the size of your partition – you should first check to see whether the disk in question is affected by the problem at all. Low data throughput on a system does not necessarily indicate a fragmented disk. With the new AFD hard disks, in particular, an incorrectly configured partition can lead to significant loss of speed, even without fragmented data. To determine the degree of fragmentation, first install the e2fsprogs package, if this was not already done during the initial configuration. The tools in this package provide important data on the ext2/3/4 filesystems. When you check the partition, you will see output that shows the percentage of non-contiguous blocks in the last line. Don’t let what might look like a large value scare you: Defragmenting is not worthwhile on Linux until the value increases to more than 20 percent of non-contiguous blocks (Figure 1). Figure 1: Linux uses on-board tools to provide meaningful information about the filesystem. for a detailed overview. 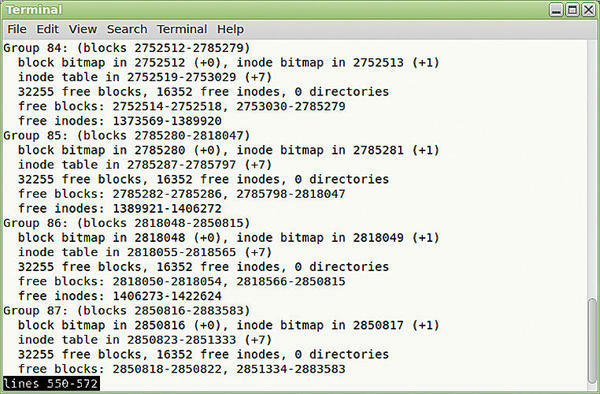 The tool first lists information on the type of filesystem and then on the individual block groups and their data. In the list of groups, take a closer look at the free blocks: line. If you only find one area here, everything is OK. But if you find several free blocks, the data contained in this group are partially fragmented. The more blocks the tool outputs, the more block groups this affects, and the more heavily the data on the partition are fragmented (Figure 2). Figure 2: Here, the filesystem has only split up a couple of files. Frequent saving and deleting of large files such as multimedia files often tears holes in the data structures. If the data of a high-resolution movie is spread across widely spaced sections, the image can contain artifacts or you may possibly experience jerky playback. Filefrag then examines the file and returns more detailed information on its respective state (Figure 3). The number of extents, that is, non-contiguous file blocks, reveals the degree of fragmentation. The more extents the software determines, the worse the affected file is split. Figure 3: The filesystem often breaks large multimedia files into smaller chunks, which it then stores in different places under certain circumstances. There are different methods for reuniting the files: If you have plenty of time to spare, you can copy the data from the affected partition to another disk, delete the original data, and then restore the copied files to the original disk. This will ensure contiguous data areas. The drawback with this method is the huge amount of time it takes for large data collections – especially if you use mass storage with a USB 2.0 interface as a backup medium. Because the degree of fragmentation of a hard disk on Linux is often in the single-digit percentage range, even after a few years’ use, the developer community has not paid much attention to data maintenance in the past. Only a few command-line programs deal with this problem – and of these, only one impressed in our lab: defragfs. To begin, unpack the small tool in a folder. Despite its small size of just under 9KB, the Perl script provides amazing functionality: It doesn’t just defrag directories and partitions, it also provides detailed information on the success of the actions. Defragfs now automatically determines the appropriate values and merges the individual files. Because the script copies the files back and forth, make sure you have enough free space in the directory in question. If you want to control the way the software works, run Defragfs with no parameters at the end of the command line. In this case, Defragfs prompts you multiple times for input. One criticism about the tool, which I observed in our lab, was that the tool jumps back to the beginning of the routine after completing its work. In this case, quit the program after it displays the statistics for the modified files by pressing Ctrl+C. Defragfs outputs a list with the merged segments of a file. For each file, it shows you in square brackets the number of fragments before copying and, at the end of each line, the number of blocks after the run. In Figure 4, you can see that large files of more than 100MB, especially, have significantly fewer segments after running Defragfs. Figure 4: Defragfs reliably brings together large files. Ext2 and its successors are so robust by design that they need virtually no manual intervention. Nevertheless, if you are a power user with a soft spot for multimedia or you operate a server with large data transfers, you will want to check your hard drives from time to time. The only tool that worked reliably on the ext2 filesystem in our lab, was Defragfs. This program works with no problem on mounted disks. The only shortcoming is the amount of time it needs to saves all the file in free areas –as in manual copying – and then restore them. However, Defragfs often rewards you for your patience with better disk performance.